Vietnam sent a stern warning to dissidents this week: criticize the government online and you’ll end up in jail. The government made that much clear when it jailed two activists in the space of four days for messages they posted on Facebook. These arrests are just a “preview of what’s to come” under Vietnam’s controversial new cybersecurity laws, activists and human rights monitors said. On Monday Doan Khanh Vinh Quang, 42, and Bui Manh Dong, 40, were found guilty of “abusing democratic and freedom rights to infringe the interests of the state” and sentenced to 27 months and 30 months in jail respectively. The men were accused of encouraging others on the social network to turn out for protest marches against government policies or writing posts that were seen as critical of the ruling Communist Party. These posts “distorted the guidelines and policies of the party and the state, and defamed party and state leaders,” the police said, but activists and human rights monitors say these convictions are part of a bigger trend of government-led censorship of social media that threaten free speech and democracy in Vietnam. “These convictions are yet another travesty of justice,” Duy Hoang, spokesperson for Viet Tan, an unsanctioned Vietnamese pro-democracy party, told VICE News. “Hanoi is giving the world a preview of what’s to come, as their Orwellian control further extends onto social media. Introducing the cybersecurity law will simply codify their crackdown on freedom of expression,” Hoang added. In August, Vietnam sentenced 53-year-old environmental campaigner Le Dinh Luong to 20 years in jail for similar offenses — marking one of the most severe sentence for national security crimes in Vietnam in recent memory. Much like this week’s arrests, Luong’s case highlighted the government’s increased focus on social media posts to suppress dissenting voices in the one-party state. Things could soon get worse. In June, Vietnam approved a new controversial cybersecurity law that takes effect in January. Among the most significant measures in the new legislation is a requirement for tech companies like Google, Twitter, and Facebook to store data locally, a move activists, human rights groups and technology companies worry will lead to even greater ability to see exactly what citizens are doing online across popular services like Facebook. The new law will mean they will be able to force Facebook and others to hand over more data about citizens’ online activity. 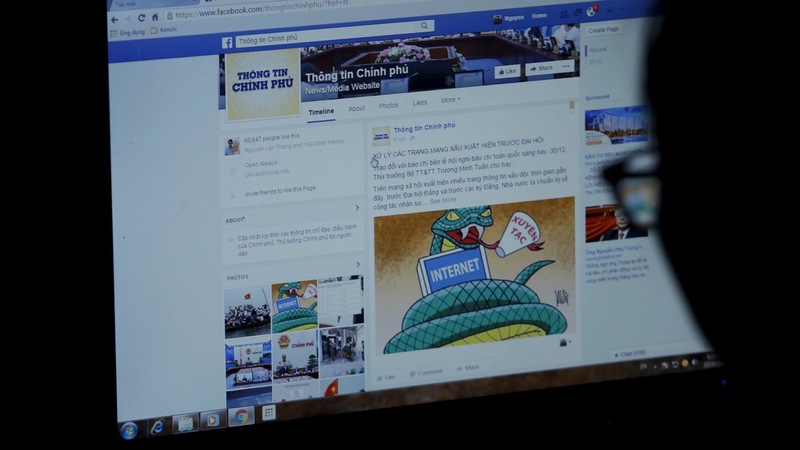 “With the sweeping powers it grants the government to monitor online activity, this vote means there is now no safe place left in Vietnam for people to speak freely,” Clare Algar, Amnesty’s director of global operations, said at the time the law was passed. The government has already indicated that if Facebook data was stored inside the country it could seek to access it in criminal investigations. The new law raises serious questions about whether Facebook will take adequate steps to ensure its customers’ privacy and safety are protected. In July the Congressional Vietnam Caucus sent a letter to Facebook, Google, and Twitter, urging them to engage with the Vietnamese government to limit the scope of the new powers. But Facebook already has a close relationship with the Vietnamese government, offering the information ministry a direct line to the company’s employees who take down or block accounts and content that is deemed to violate the law. Vietnam is an important market for Facebook, with the estimated 58 million users it is the social network’s seventh-biggest market globally. Facebook was not immediately available for comment about the most recent convictions.